Finlay Calder was the guest speaker at the monthly meeting of the Memories Club at Linlithgow Rugby Club. The aim of the Memories Club aka LOSS – Linlithgow Old Sods Society – is to engage with older members to improve their physical and mental capabilities. We play walking rugby, also once per month, and have a quiz to stimulate the minds. Finlay, or Fin as he is known in rugby circles, was born in Haddington in 1957, and was educated at Stewart’s Melville College. One of four rugby playing brothers, he played rugby at open side flanker where he won 34 caps for Scotland between 1986 and 1991, seven as captain. Fin won three caps for the Lions, and in 1989 was the first Scottish player to captain the British Lions since Mike Campbell-Lamberton in 1966, and the first winning Lions captain since Willie John McBride in 1974. His international debut was against France in 1986, and his swansong was against New Zealand in the third place play off match in the 1991 Rugby World Cup. Fin Calder was the triumphant captain of the 1989 British and Irish Lions squad in Australia, and will always be remembered for his rampaging display in Scotland’s Grand Slam decider against England in 1990. Fin was awarded the OBE, and was inducted into the the Scottish Sports Hall of Fame in 2003. Jim, his twin brother, who also played for Scotland and the Lions won the last of his caps against Wales in 1985, so they never played together for Scotland. The normal practice for our guest speakers, is to talk about their playing career, what went on, on the field, and more entertainly, what went on, off the field, but Fin spoke about his views of how a rugby club should be run and his vision for its improvement into the future. 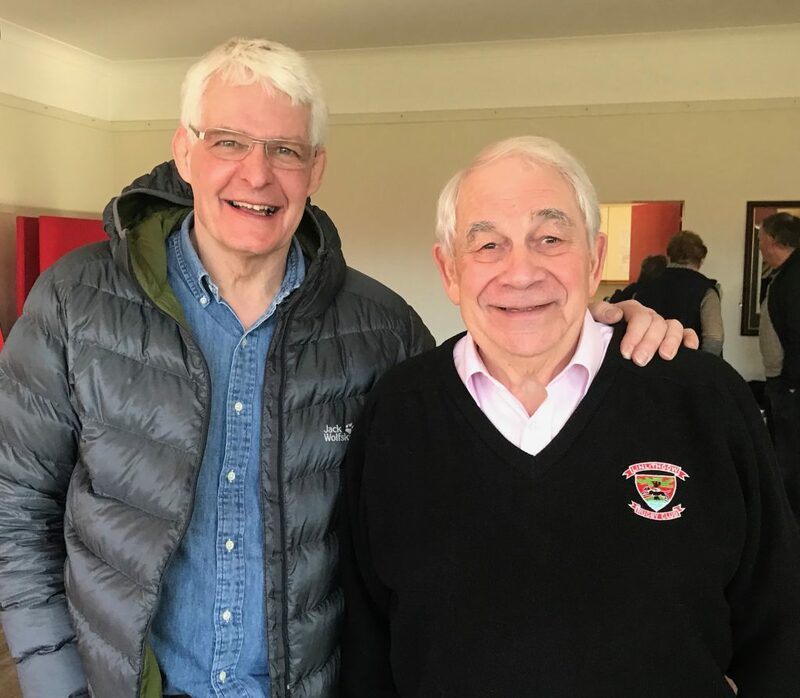 When Fin became the Chairman of Stewart’s Melville Rugby Club in 2018 he said that his aim was to help the Inverleith Club to bounce back from relegation. When you drop a level there are a number of implications both financial and practical. Whatever happens we need to pull everyone into the club to stabilise the ship and rebuild. If people can help in the smallest way then that should be appreciated. Rugby is changing, people have different priorities , and rugby is not the first priority. There is no need to be coy about traditional rugby clubs’ responsibility to be the best breeding ground for the future generations of Scotland players. It is also important to have a friendly club where visitors want to come back, and we must engage with young people to get them into rugby, as in today’s world they have so many other interests. Last season both Stewarts Melville and Heriots both struggled to put out a third XV. This season players from Heriots and Stew Mel have got together to form the Ferry Road Wanderers, playing in multi-coloured strips, and have successfully played most weekends. Fin told a number of interesting stories first of all about the history of their involvement with the Inverleith pitch which started in 1897, when it belonged to the SFU and football was played. He told about David Sieveright, captain of the Lions in 1904 and captain of Scotland in 1906, who told of a player at a game in France just after the First World War who was berated by one well known Frenchman who told him ‘your players are all half blind’ The reply was ‘that’s right I’ve only got one eye’. In 1926 the British Rugby Club of Paris was formed, mainly of ex pats, but after 1945 funds were low, and golf days were organised to to keep the club going. There are now 55 members from 14 different countries. Prior to a game between Watsonians and Melville, the Watsonian captain told his opposite number “if you win I will eat my jock strap.” Melville won the game, for the first time in many years, and their captain Fraser Morrison (well known as a Linlithgow Rugby Club founding member) cut up a jock strap and presented it on a plate to the Watsonian captain in front of his players in the changing room after the match saying “I think this is yours.” How much of the jock strap was actually consumed is a matter of legend! The Q & A session was held after the coffee and cakes. Certainly one of our best speakers at the Memories Club, and who knows, possibly a President of the SRU in the offing.